No, that isn't pretending to be a family, that's going out as one to a historical event and dressing and working accordingly. Myself and the three children recently spent nearly two weeks at Kentwell Hall in Long Melford as part of their Great Annual Tudor Re-Creation. It's not a particularly cheap or easy activity, and it was several months in the planning. The application stage started way back in January, and the forms included passport photos, then there were open days to meet the more established re-enactors and to be interviewed by the man in charge. And then there was costume buying, borrowing or making, and all the accessories too. You might think Tudors lived in simpler times, and in a lot of ways they did. But there were a lot of rules and conventions too - you don't go out with your hair uncovered so everyone wears a coif, under a hat if a hat is to be added. 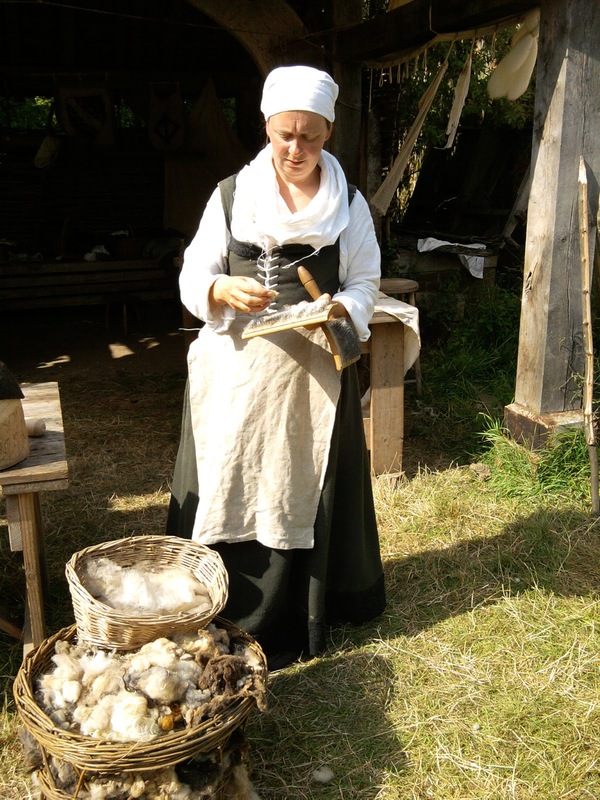 And the women's outfits are quite cumbersome - linen shift or smock, under kirtle, then kirtle, which is the bit with the lacing up the bodice. If you don't have sleeves as part of your kirtle you have ones that lace or pin on - most working women don't actually wear them but have them dangling from their shoulders and tucked into their belt at the back. And over all of that a linen apron, and possibly a coat. All of which costs time and money to make. Children's clothes aren't much simpler, and pre teen girls are dressed as women. And then there are the accessories. A basket for carrying things in. A knife in leather sheath, wooden or pottery plates (wooden are better, they don't smash so easily), spoons and cups. I was still acquiring things partway through our stint at the weekend cart boot sale, and it meant more and more to carry every day. Re-enactors start their day early (though not nearly as early as the Tudors themselves would have done). You get up on the campsite, get dressed into layers of tudor clothing and then hike over for breakfast. It's not really that far, but when you're wearing all those layers and carrying the stuff for a day and a toddler, it's quite far enough that you don't want to to and fro. Breakfast, and then the final touches - for me that meant taking off my glasses and putting in contacts. I'm blind as a bat without any correction and I wasn't prepared to labour under squinting and headaches for that length of time. Smallest adapted surprisingly well to being a Tudor. She learnt to say nay and aye, and pigling, and pottered around mostly happily as long as I was within sight and milk was in easy reach. Turns out it's quite easy to breastfeed in a bodice, just don't lace it up to tight and make sure your shift has a low cut neck as it were. I wore a pinner (piece of linen) over to protect from sun and cold which always served to preserve modesty. Not that the Tudors laboured under the same kind of body modesty we do, you've only to look at men's codpieces to work that one out. Which is probably a good if tantalising way to draw this post to a close for now. I hope you've found it interesting.